Hello friends! 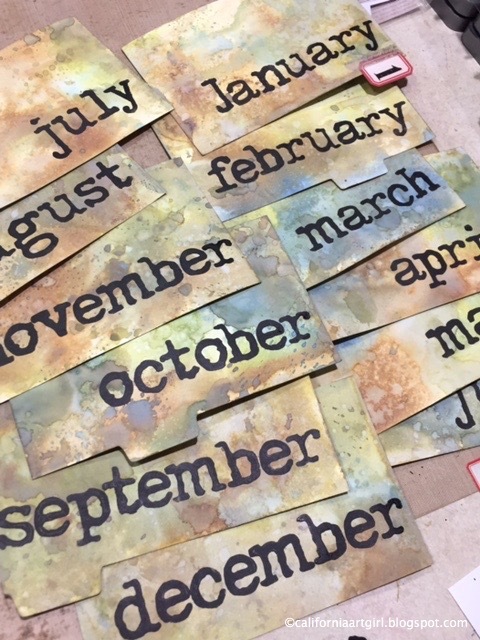 I have another project from Creativations from the Tim Holtz Idea-ology booth. 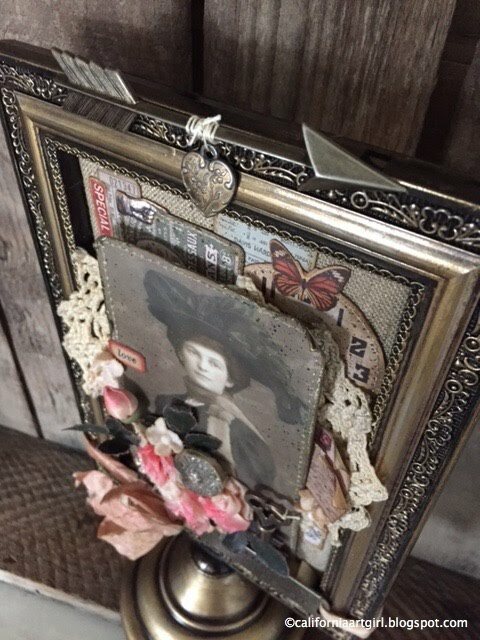 My Victorian Flip Frame is a mix of new and vintage items. I think it's important to find different ways to use the same product. The Flip Frame can be used as a it's intended purpose hanging memories or the like with the rings that come with the frame. 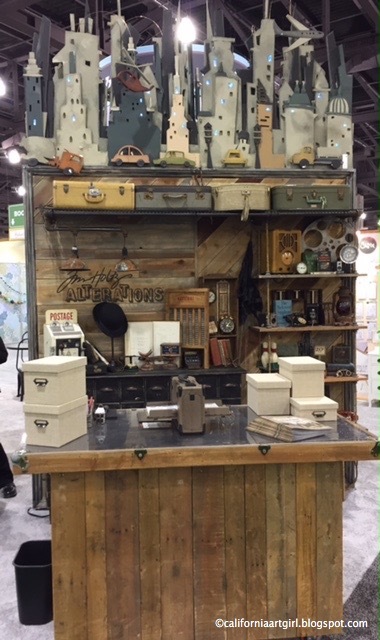 You can build a box to fit the back and create a shadow box, love this idea. And now I've created just a framed mixed media piece. The Flip Frame was colored with Gold Metallic Mixative Alcohol Ink and Black Soot Distress Paint to create a dramatic vintage effect. 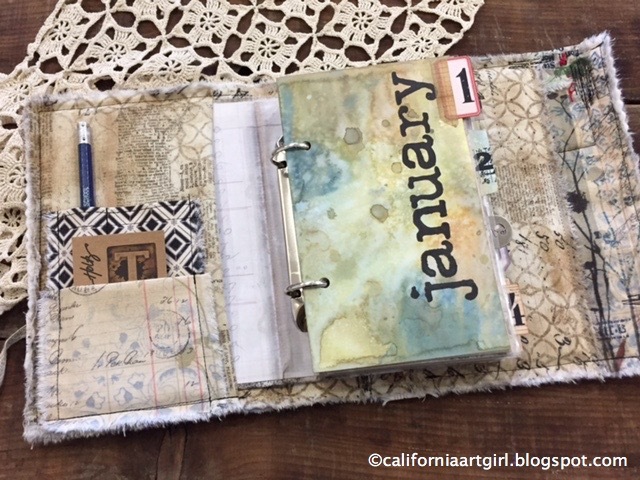 Cut a piece of chipboard to fit the back of the Flip Frame then cover with Textile Surfaces for the background. Create a collage with the new Ephemera Snippets over the background. Some of the Ephemera has stitching added around the edges. I love the size of the mini Ephemera I can tell it's going to be a favorite! 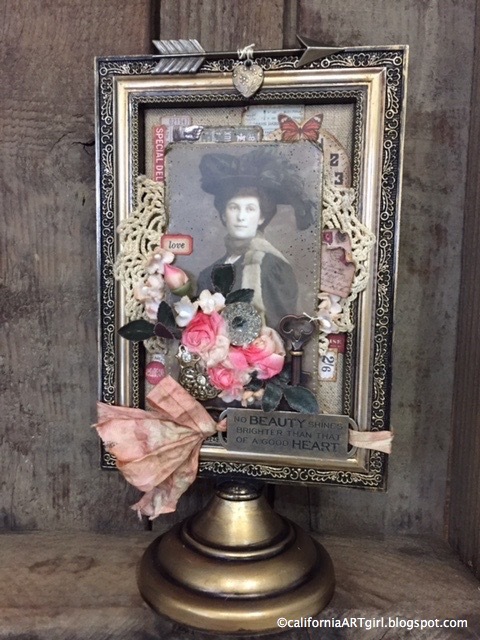 A vintage doily is layered over the Ephemera and then the lady with the beautiful hat was added after stitching around the edges. The lady with the beautiful hat is from the Found Relatives pack. 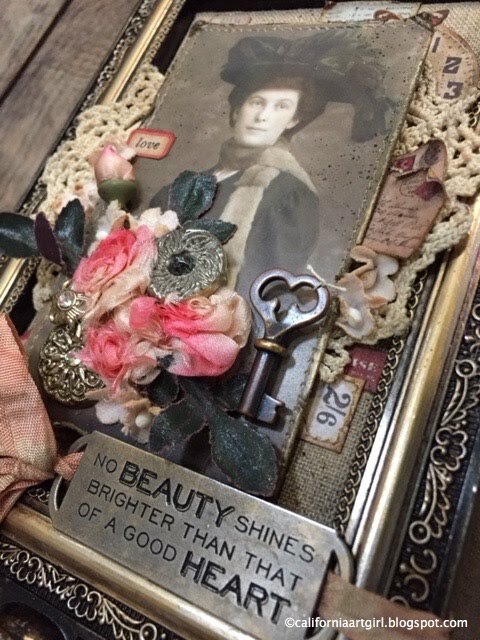 Atop the photo are vintage flowers, Bouquet, Locket Key, Fanciful Adornments, even a little Vial Label with the word love has been added. The Quote Band was attached with a piece of Crinkle Ribbon that was dyed with Distress Ink. A large Adornment Arrow with the little Heart tied on with a piece of string covers the indentations of the frame. I used the Distress Splatter Brush to add a little Black Soot Distress Paint over the otter edges of the piece. What are some of your favorites from the new release? Hello friends! I'm back from Creativation and what a great show it was. 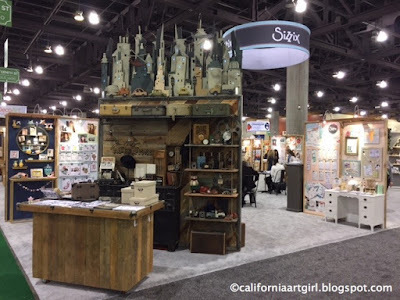 Thank so much to everyone that came by the Sizzix booth and said hello! I loved meeting new friends and catching up with old friends. I'm just sorry it's only once a year. I have meet some of the most amazing people in this industry. 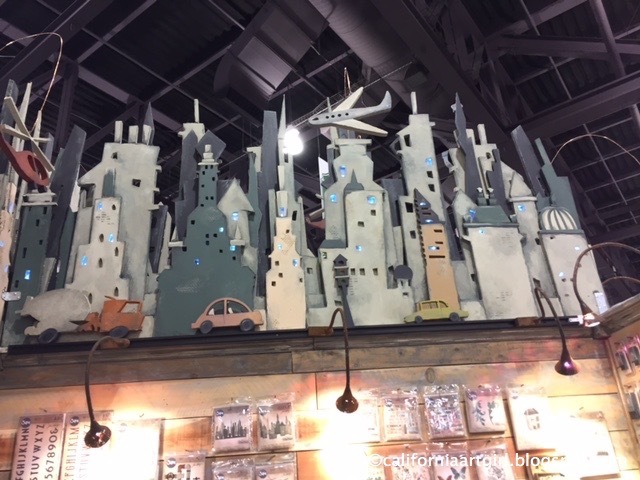 The Sizzix booth was a show stopper with the new Tim Holtz release of Cityscapes, Wildflowers, Butterflies and so much more. I was so excited to work the both again this year. I also had the pleasure of working with Aida Haron from Singapore so good to finally meet her in person. A special thank you to Tim Holtz, Jen Long and the Sizzix crew for welcoming me back to the booth. Now to share one of my favorite projects that I created for the show. My Fabric Planner. I have combined all the things I love the most fabric, paper, stitching, inking and stamping. 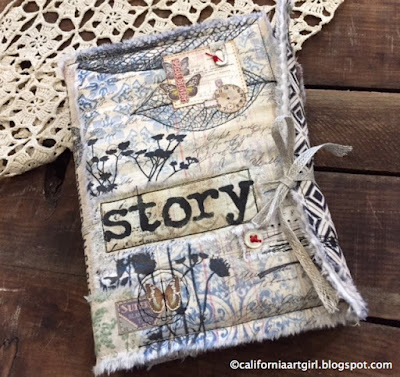 I will be adding this to my 2017 workshop list so watch my blog for more details! The new Cling Foam Stamps are so easy to use! And using them with the new Tonic Stamp Platform is a perfect match. Also the new Distress Oxide Inks are a must have! Just look at how magical these tab pages look. A few of my favorite products from the show! Just click on the link to head over to Simon Says Stamp.